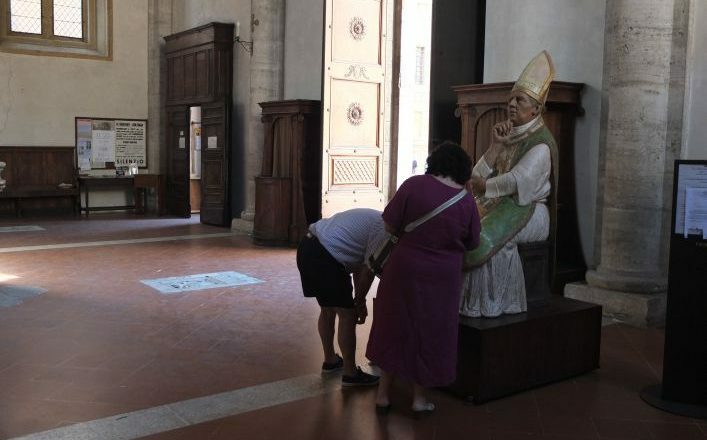 Walking Holidays Tuscany, from Montepulciano to Siena: A self-guided walking holiday through a Renaissance landscape. 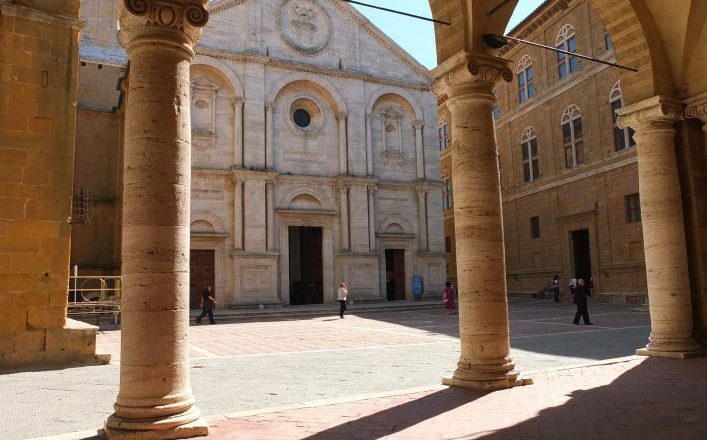 Enjoy magical scenery, excellent food and wine, and the historic towns of Siena and Pienza. This is the Tuscany that you have always dreamed of. You will walk among the rolling hills of Renaissance paintings, a landscape of blue sky, golden ochres and lush green; from the classic vineyards of Vino Nobile and Brunello to walled medieval and renaissance towns, and visiting superb churches and abbeys. At the end of each day, comfortable, traditional hotels (see ‘Additional Information’ tab). 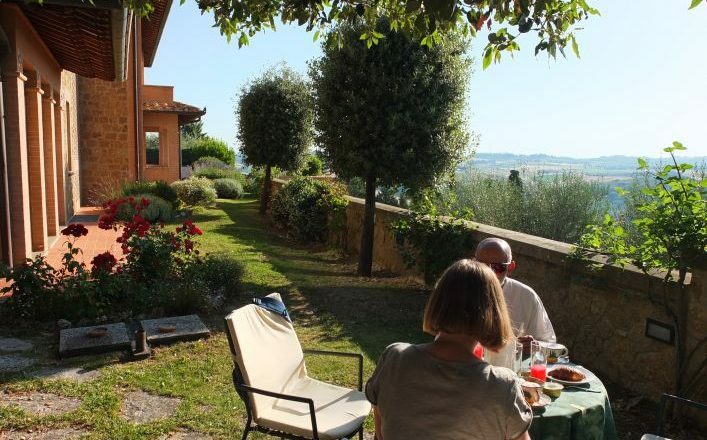 £790.00 per person – staying 3 star hotels throughout (no overnight Sant Antimo but two nights in Montalcino unless you request Sant Antimo where you will stay in a 2 star inn or agritourismo). Single room supplement £195.00 (double room for single occupancy). Luggage transportation each walking day. Local contact in case of emergency. Easy, medium. Terrain: mostly farm tracks along open, rolling hills. Distance: average about 14 kms. per day. 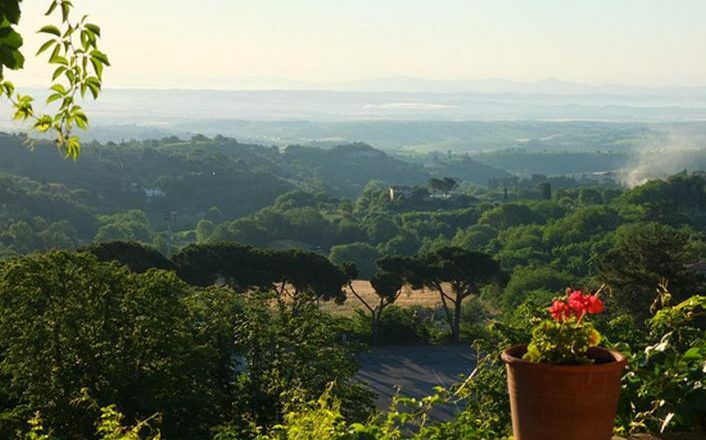 Arrive at your hotel in the centre of the medieval walled town of Montepulciano, built on a limestone ridge with marvellous views over the surrounding countryside. Overnight Montepulciano. (15kms/9.4miles. Height gain 490m.) 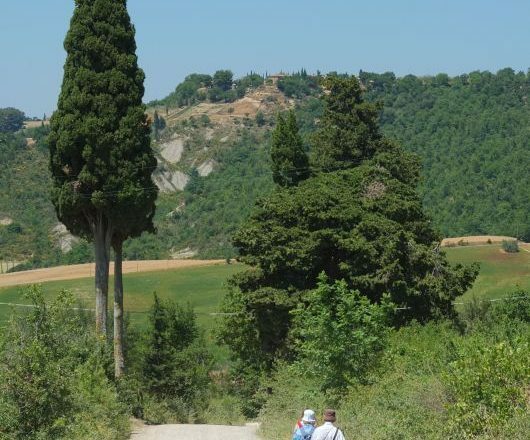 This walk is interesting for its varied landscape: from Montepulciano to Monticchiello you walk through countryside with olive groves, vineyards, walnut and fig trees and through typical Mediterranean woods, with holm oaks (evergreen oak ‘Quercus Ilex’), heather and broom. 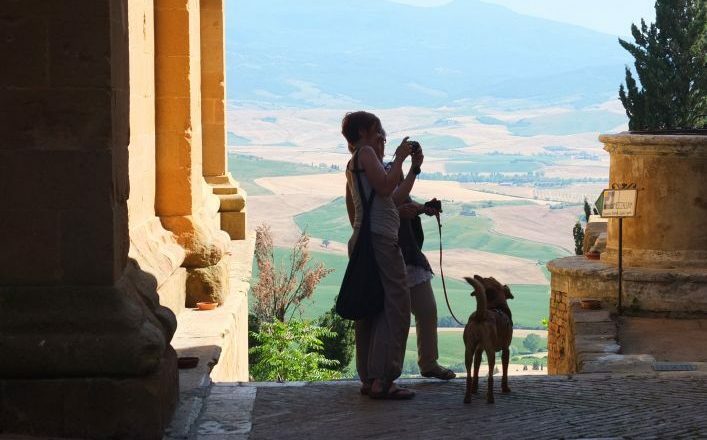 From Monticchiello to Pienza you walk on the balcony of Val d’Orcia, a valley among beautiful rolling hills, framed by wheat fields, and occasional dark green pinnacles of cypress. Overnight in the beautiful Renaissance town of Pienza. (14 kms/8.75 miles. 415m) The walk today is classic Tuscany as portrayed in films (The English Patient, Bertolucci’s Sleeping Beauty for example), through rolling hills with lines of cypress and hilltop country houses, to the pretty little medieval town of Quirico d’Orcia on the Via Francigena (the old pilgrim route) and on to Bagno Vignoni, famous for its Roman and Renaissance thermal baths. Overnight Bagno Vignoni. (15 kms/8.75 miles. 585m) The walk today takes you through a holm oakwood which separates Bagno Vignoni from Ripa d’Orcia. The area is rich in wild life – wild boar, roebuck deer, fox, badger. On arrival in Sant Antimo visit the beautiful Romanesque abbey – it has been both Benedictine and Guglielmite in its time, and it currently houses a French pre-monstratensian Norbertine) community – built in the 12th century atop foundations that date to Charlemagne in the early 9th century. (9.1 kms/6.25 miles. 300 m) From the vineyards and olive groves around the Abbey you walk towards the holm oak wood that cover the hills between the Abbey and Montalcino. From the meadows on the top of the hill, enjoy outstanding views of Val d’Orcia and the extinct volcano of Mt. Amiata (1700 m., located south of St. Antimo). Overnight in the medieval hilltop town of Montalcino, famous for its Fortezza, Brunello red wine and honey. (18 kms/11.25 miles. 300m) Walk from Montalcino passing through some famous local wine estates such as Baricci and Casato Prime Donne. After 5km the landscape changes and you will notice more meadows for sheep farming, and plots of land for crops like corn, tobacco, wheat and barley. The area is greener than the Val d’Orcia thanks to the river Ombrone. 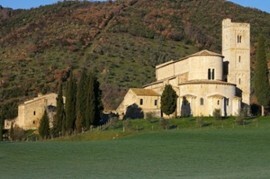 Overnight in the charming small medieval town of Buonconvento on the via Cassia. (13 kms/8.2 miles. 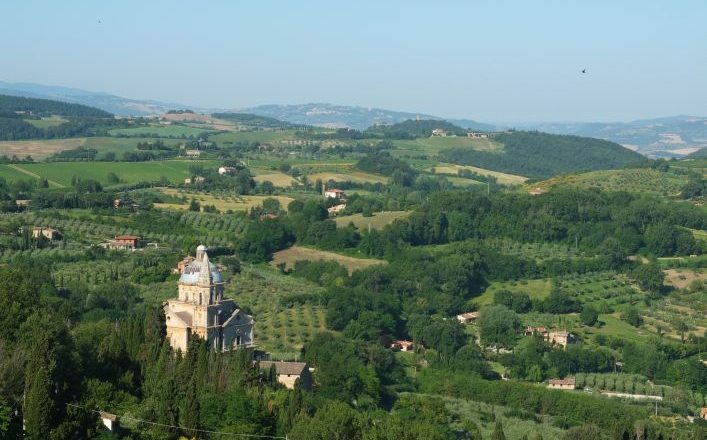 350m) Walk from Buonconvento to the monastery of Monte Oliveto Maggiore. Start by walking through the Pieve a Salti estate, a large farm that cultivates mainly alfalfa, corn, and sunflower. Then after the “Podere Olimena” walk through fields and a small mixed wood until you reach the spectacular Crete Sienesi. Views of the Monastery and Chiusure. 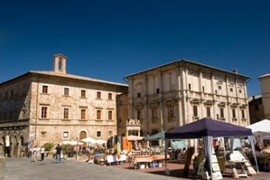 Transfer to Siena and overnight in your hotel located in the centre of the city. 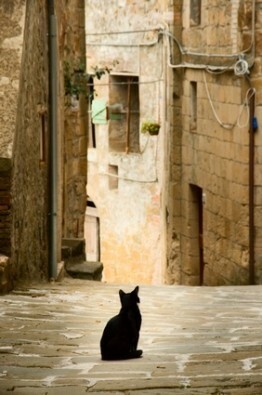 If you prefer it is possible to omit the walk from Sant Antimo to Montalcino and have a rest day in Montalcino. Price will be the same and a transfer will be arranged. Please ask.We can also arrange for extra nights along the route – please ask for prices.